During your holiday in Veneto, Italy, one of the worth-seeing medieval towns and villages is Monselice, located on the plain at the edge of the Colli Euganei - Euganean hills- and not far from the poetic Arquà Petrarca. A great place for a day trip, where you’ll be strolling around its cobbled lanes, enjoying the view of its medieval center and castle and taking a walk up to the scenic Colle della Rocca (151mt/495ft at its peak). 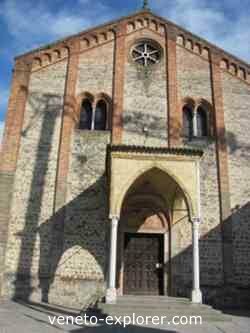 Monselice became a free Commune in the 12th century. Under the rule of Ezzelino da Romano, Lord of the Marca Trevigiana during the 13th century, the village was completely surrounded by defensive walls. During its peak in the 1300’s the town was encircled by a large surrounding walls plus 4 more internal walls. Unfortunately just a part of the walls is left nowadays, after the demolition occurred in the 1800’s. In 1405, like many towns in the Veneto terra firma, Monselice passed under the dominion of the Republic of Venice, and its surrounding walls lost their defensive function. Monselice is a small town thus it will take you just a couple of hours to wnader around the pedestrian historic town, included climbing up to the hill called Colle della Rocca. 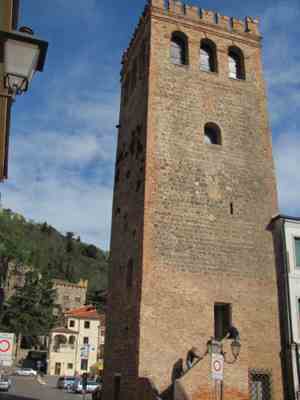 The thirteenth-century tower - Torre Civica - turned into a clock tower in 1504, overlooks the central Piazza Mazzini. Past the Mazzini square continue forward and take the suggesting via Santuario: you’ll be walking among aristocratic houses until the entrance to the Castello. The castle – which boasts an historic great interest- is made up of different buildings dating back to different eras. The oldest facade at your right, with attached Romanesque house, dates back to the 1200's, and was the stronghold of Ezzelino da Romano. It is named castelletto – small castle. The more recent side of the castle, on the left, is named Ca’ Marcello, after the Venetian family who built it in the 1400’s. On the left of Ca’ Marcello rises the 1200’s massive Torre di Ezzelino or Ezzelino’s tower. 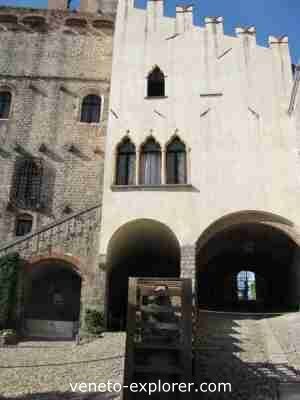 Inside the Middle Ages castle there are 5 rooms still magnificently furnished with Renaissance furnishing, precious tapestry, ancient frescoes and paintings, fine ceramics and a collection of weapons and armors. There is also the Museo Antiquarium Longobardo which displays objects and weapons of the time. The Castle can be visited at set times of the day from April through November. Continue along via del Santuario which climbs little by little towards the hilltop. 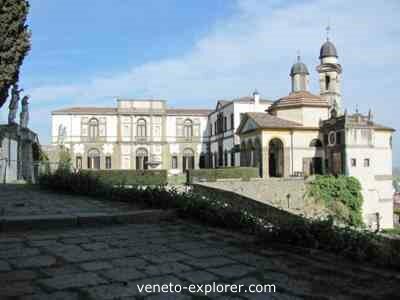 After a few minutes you’ll reach the Villa Nani Mocenigo, built by the Venetian aristocrat Agostino Nani in the late 1500’s. 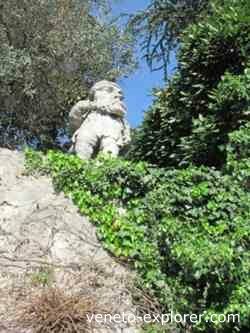 The villa is private property, closed to visitors, but you’ll see impressive steps behind the gate and admire a series of grotesque marble dwarfs upon the surrounding wall. 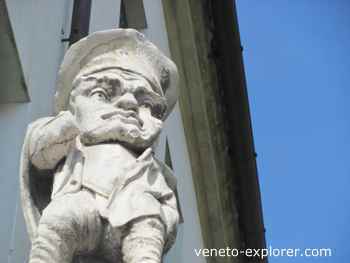 The allegorical dwarfs are a clear allusion to the owner’s name Nani, Italian for dwarfs. Past the villa’s gate keep walking uphill as far as the old cathedral, Chiesa di Santa Giustina, dating back to 1256. Inside you can admire paintings of the 1400’s Venetian School. Continue on, past two big stone lions on high columns and you’ll get to Piazza La Rotonda, from where you’ll enjoy a superb view on the plain beneath. After walking through Porta Romana, which marks the entry to the sanctified area, you’ll be in a lane that is both the way to the monumental villa Duodo and a pilgrimage route – Sentiero delle Sette Chiese- lined by a series of chapels built in the 1600’s after the designs of Vincenzo Scamozzi, contemporary with Andrea Palladio. At the end of the lane you’ll admire the elegant group of buildings making up Villa Duodo – closed to the public - built in the late 1500’s by Vincenzo Scamozzi, and its Italianate garden, embellished by huge statues and a majestic stone amphiteather where visitors can stop for a rest. Alongside the amphiteather there’s an evocative flight of steps climbing up to the Rocca and the Federico II keep, the Mastio Federiciano. Unfortunately nowadays (2011) the stairway is closed to the public. 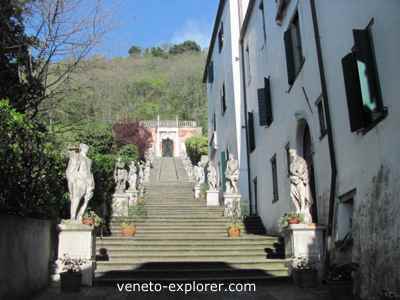 Go back to Piazza la Rotonda and walk down the steps in the Vicolo Scalone returning to the centre of Monselice. After visiting the historic Monselice, if you want your holiday in Veneto to be under the sign of nature and health, you can walk along the trail up to the Natural Park of Colle Montericco (329mt/1080ft) for a pleasant 2,5km/1.55mi hike among a great variety of wildlife (the trail starts in via Sottomonte, near the train station).